Special guest post by M. Joseph Sheppard. The left has gone crazy, lashing out in their portends of defeat at their “2 minute hate figure-Sarah Palin. Really, it is astounding, dumbfounding actually, that the closer the election gets, the greater the number of near hysterical anti-Palin tweets from “progressives.” It seems the Liberals have gone collectively mad. Palin is not running for anything, they deem her “irrelevant and “a diminished figure”. But, Palin makes a statements-on climate change/Ebola for example and Liberal’s Tweets explode. 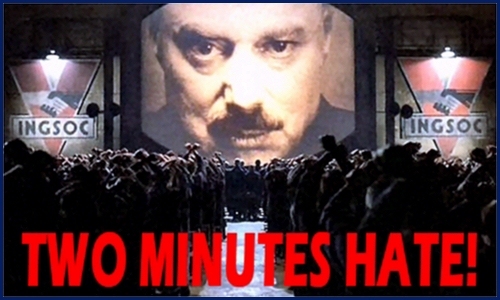 It was nearly eleven hundred, and in the Records Department, where Winston worked, they were dragging the chairs out of the cubicles and grouping them in the center of the hall opposite the big telescreen, in preparation for the Two Minutes Hate. As usual, the face of Sarah Palin, the Enemy of the Democratic Party and the Main Stream Media and especially leftist bloggers, had flashed on to the screen. There were hisses here and there among the audience. A little red-haired woman journalist gave a squeak of mingled fear and disgust. Palin was the renegade, one of the leading figures of the Republican Party, almost on a level with the near mythological figure “Reagan”, and had engaged in counter-liberal activities, had been condemned to irrelevancy, but had mysteriously escaped from liberal media attacks and gained a mass following. The programmes of the Two Minutes Hate varied from day to day, but there was none in which Palin was not the principal figure. She was the primal enemy, the defiler of the Party’s plans including the Death Panels. All subsequent crimes against the Party, all treacheries, acts of sabotage, heresies, deviations, sprang directly out of her teaching. She was still active and hatching her conspiracies: perhaps under the protection of secret paymasters, perhaps even — so it was occasionally rumoured, the mysterious Koch brothers and the equally mysterious Fox Murdoch. The diaphragms of all liberals in the room, especially Winston’s were constricted. He could never see the face of Palin without a painful mixture of emotions. It was a lean face, with a great mass of raven hair — a clever face, and yet somehow, to the now maddened Dem’s somehow despicable, with a kind of beauty in the pert nose, on top of which a pair of designer spectacles was perched. Palin was delivering her usual venomous attack upon the doctrines of the Party enough to fill one with an alarmed feeling. She was abusing Big Obama, She was denouncing the big government policies of the Party, She was advocating freedom of speech, freedom of the Press, freedom of assembly, freedom of thought, She was crying that the principles of the revolution had been betrayed. Before the Hate had proceeded for thirty seconds, uncontrollable exclamations of rage were breaking out from half the people in the room. The face on the screen, and the terrifying power of the Tea Party army behind it, were too much to be borne: besides, the sight or even the thought of Palin produced fear and anger automatically. She was an object of hatred more constant than either Bush or Cheney. But what was strange was that although Palin was hated and despised by everybody on the left, although every day and a thousand times a day, on platforms, on the telescreen, in newspapers, in books, her theories were refuted, smashed, ridiculed, in spite of all this, her influence never seemed to grow less. In its second minute the Hate rose to a frenzy. People were leaping up and down in their places and shouting at the tops of their voices in an effort to drown the maddening voice that came from the screen. The little red-haired woman had turned bright pink, and her mouth was opening and shutting like that of a landed fish. A dark-haired girl behind Winston had begun crying out ‘Swine! Swine! Swine!’ and suddenly she picked up a heavy Democratic Party talking points memo book and flung it at the screen. It struck Palin’s nose and bounced off; the voice continued inexorably. In a lucid moment Winston found that he was shouting with the others and kicking his heel violently against the rung of his chair. I picture Sarah Palin as Flash Gordon and the left as Ming The Merciless. Their obsession is THAT extreme.